A molar pregnancy, or hydatidiform mole, is a nonviable conception so cannot develop into a normal baby. It is the most common type of gestational trophoblastic disease (GTD), which are tumors that develop from a group of cells (trophoblasts) in the early fertilized egg. These cells were destined to form the normal placenta. About 1 in every 1,000 conceptions in the United States develops into a molar pregnancy, according to the National Cancer Institute (NCI). The incidence is higher in other parts of the world such as Asia. There are two types of molar pregnancies, and they are most often benign. Complete molar pregnancies contain only trophoblastic fluid-filled sacs that resemble clusters of grapes which can be seen on ultrasound. Complete moles have no recognizable formed embryo or fetus. Partial molar pregnancies have a combination of these grape-like cystic clusters plus the beginnings of an abnormal embryo or fetus which cannot fully develop. Occasionally, there are areas of normal-appearing placenta tissue. These conceptions can grow faster than normal, and either type is usually diagnosed by ultrasound in the first or second trimester. The complete hydatidiform mole: Occasionally, an egg contains no nucleus or chromosomes. A complete mole forms when a single sperm fertilizes one of these "empty" eggs and duplicates itself, or two sperms fertilize the empty egg. The mole contains no maternal but 46 paternal chromosomes. The partial hydatidiform mole: This develops when a normal egg with its nucleus is fertilized by two sperms instead of one, or the paternal chromosomes duplicate into two sets. The conception therefore ends up with three sets of chromosomes (69 instead of 46): one set from the mother and two sets from the father. It is not possible for a normal baby to develop with this extra set of chromosomes. Hydatidiform molar pregnancies usually occur in the uterus but in rare cases can implant as an ectopic mole in the fallopian tube. Age: Women over 40 and under 20 are at highest risk for complete molar pregnancies. A history of a previous mole: This is present in one to two percent of cases. Asian women may also be at greater risk than those of other races. A syndrome of preeclampsia: This can develop early in the first or second trimester and includes high blood pressure, protein in the urine, and swelling in the hands, feet and/or legs, and face. Note, preeclampsia usually doesn't develop until later in normal pregnancies. The diagnosis of a mole should be also considered when prolonged vaginal bleeding continues after a normal delivery or after treatment of a miscarriage, an ectopic pregnancy, or other abnormal pregnancies. Most women with a hydatitiform mole present with abnormal vaginal bleeding in the first or second trimester. This usually leads to an initial evaluation and pelvic exam to help distinguish between a mole, a miscarriage, an ectopic pregnancy, or other abnormalities. An ultrasound: This is the key imaging study to locate the pregnancy and look for the ultrasound signs of a mole - the clusters of small cystic or snow-like echoes in the uterine cavity. A dilatation and curettage (D&C): This procedure is a scraping or suction of the uterine cavity to remove the abnormal products of conception for diagnosis and treatment. The doctor might be able to identify the abnormal molar tissue by inspection, or he has to wait for a microscopic exam by the pathology lab to confirm the diagnosis. The initial D&C to remove the pregnancy tissue for examination and diagnosis might be sufficient treatment. If not, the doctor will do another therapeutic D&C to remove all the molar tissue from inside the uterus. Additional treatment, as outlined by the National Cancer Institute, depends on whether a woman has any complications of gestational trophoblastic disease (GTD) or persistent disease after initial treatment. Potential complications after the D&C treatment are heavy bleeding or hemorrhage and anemia. Some women require a blood transfusion. In a few cases where clotting factors become abnormal, some women might need a life-saving hysterectomy because of significant hemorrhage. For those women who develop of hyperthyroidism and preeclampsia, the symptoms usually resolve soon after treatment. Rarely, some women are more severely affected by these two disorders and will need to be hospitalized for appropriate treatment. 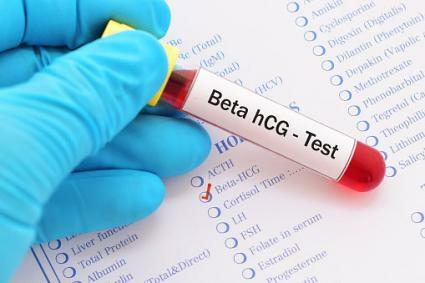 It is important to monitor the blood HCG level after the initial D&C and after any other treatment until it becomes negative to ensure no molar tissue remains. The HCG should be negative within three months after treatment. Prolonged elevation and continued vaginal bleeding are the common signs of persistent GTD and a risk for a cancerous mole. Doctors advise women to use an effective birth control method for six to twelve months. This decreases the chance of a new pregnancy confusing the HCG monitoring, as well as the risk of a repeat mole with so early a new pregnancy. According to the Mayo Clinic, about 20 percent of women with a molar pregnancy will have a problem of persistent GTD, where trophoblastic tissue remains in the uterus after the treatment D&C. Invasive mole: In this case, the molar tissue penetrates into the muscle (middle) layer of the uterine wall. This occurs in about 20 percent of moles. This can be cured with chemotherapy drugs, or a secondary option of a hysterectomy, depending on the woman's circumstances. Choriocarcinoma: These cancerous moles occur in about 1 to 3 percent of cases. Choriocarcinomas are more common with complete than with partial moles and have the potential to spread to other parts of the body. Choriocarcinomas can be treated successfully with a cocktail of chemotherapy drugs and a hysterectomy. Most molar pregnancies are benign and are cured after a D&C to remove the products of conception from the uterus. Occasionally, abnormal tissue persists and may be cancerous. Don't ignore prolonged bleeding after treatment of a mole or other abnormal conceptions or after delivery of a normal pregnancy.